Leviton Decora® 6-Gang Standard size wallplate/faceplate in stainless steel color, features 302 stainless steel construction with smooth finish. It has smooth face and rounded edges to resist dust accumulation. 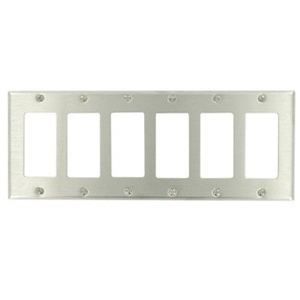 Rectangle wallplate/faceplate measures 11.81-Inch x 4.5-Inch x 0.220-Inch. Device mountable wallplate/faceplate with six decora/GFCI configuration, has 0.406-Inch x 0.942-Inch cutout. It comes with color-matched metal mounting screws. Wallplate/faceplate is UL listed and CSA certified.